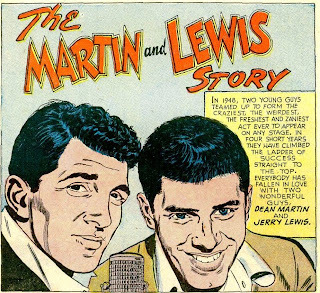 From 1952 through 1957 DC Comics published a comic book series devoted to Dean and Jerry, titled The Adventures of Dean Martin and Jerry Lewis. The series ran for 40 issues, until the breakup of the team. From that point on, the series was renamed The Adventures of Jerry Lewis and ran for another 84 issues. It's very odd to think of these guys as comic book heroes, but it's also a testament to their popularity at the time. 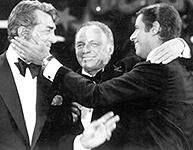 Much of the material in the series could have been drawn directly from the duo's stage act, with Dino portrayed as the suave ladies' man and Jerry the irrepressible nitwit. Issue #2 of the series included a fairly straightforward 3-page bio of the team. Once in awhile you might still find these titles on eBay. A quick survey this morning showed several of the 10 cent issues selling for upwards of $30 apiece. It's a real pleasure to welcome Budget Car Rentals as our newest sponsor - and to be able to offer you $30 off weekly rentals and 10% off all other rentals through Budget when you follow this link. On our trip down to visit with P-Dub last year, we rented from Budget and it was a very pleasant experience from the moment of reservation through when we turned in the keys. Their service is excellent, the van was clean and well-maintained and the price couldn't be beat. Thanks to Budget for their support of the show! Remember you can always find the latest special offers from our sponsors at OFFERS.NOEBIE.COM on the Web. Here's some good news if you haven't yet taken advantage of our special eMusic offer. They have decided to renew the campaign for another six months. You can get 35 song downloads absolutely free of charge and with no obligation to buy anything under the 14-day trial subscription available through our MEVIO offers site. eMusic has over 3 million tracks of DRM-free MP3 downloads, compatible with any MP3 player. Sign up for our free trial offer today with no obligation. Whatever you decide to do after the trial period, the downloaded tracks are yours to keep. I'm donating 1/4 of all proceeds from this campaign to charity. Sign up today, help support this show, help support worthy causes and score some great music for free! 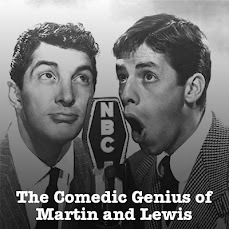 I'm proud to welcome Brookstone.com as a sponsor for The Comedic Genius of Martin and Lewis. Brookstone is a leading specialty retailer in the U.S. For over forty years, Brookstone has provided an extensive range of consumer products that are functional and quality-designed, with the majority being exclusive to Brookstone. Best known through the years for their memorable stores and catalogs, Brookstone has brought together all of their top-branded products into a single online location: Brookstone.com. Enjoy 10% Off Your Purchases Using Our Code: "Showtrue"
Through our arrangement with MEVIOoffers we're proud to offer this Brookstone coupon code for a 10% discount on your purchases. Some restrictions apply. See MEVIOoffers for details. Listen for information on the next show (coming this week).